Through its office for older people, the First Muncipality of Santiago has the mission to promote the participation and integration of older people, promoting instances of training, association, development of projects and programs aimed at improving aging processes, revitalizing the cultural and social role of older people in the community. Thus, the Municipality of Santiago has determined 5 guidelines on how to approach work with older people. These are: 1) A program of gerontological social care for the most vulnerable people focused on the promotion and protection of their rights; 2) A program to promote organizations and clubs for older people that allows the active participation of more than 6000 older people in the community; 3) A training and education program that promotes, through different techniques and topics, cognitive stimulation in the almost 800 students belonging to 52 courses per year; 4) the program of recreation and cultural extension which allows attractive and relevant offerings in recreation, access to culture and leisure promotion, and finally 5) An Innovation program that allows generating new projects of global trends, such as digital literacy for older people, employment programs in the Patrimonial Tourism area, the installation of a Social Development Center together with the Technological University of Chile INACAP, allowing for the generation of knowledge and linking the academic world and the development of local public policies. 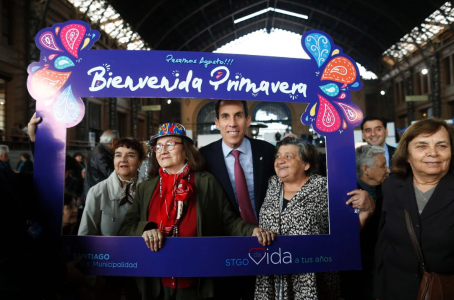 Through these actions the municipality of Santiago assumes the commitment of an age-friendly city with older adults in the community.